Sounds like something a dirty old man would say, right? Not so. Those lyrics come from the mouth of the handsome Harry Howard, an Australian musician I have come to be aware of through the mighty Dave Graney. 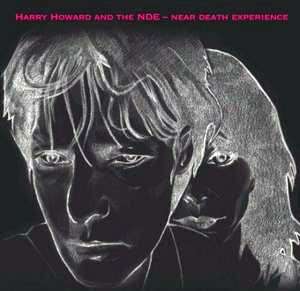 Harry's album - Near Death Experience - is, while not quite that, an experience nonetheless. The abrasive 1980s style Farfisa organ sounds combined with his proudly and somewhat uniquely (in this day and age) Australian singing accent harkens back to my teenage years when bands like The Triffids ruled the streets of my town. The dark grooves in this album are - while reminiscent of those times - an expression of Harry's experiences with life such as ageing, mortality and bad relationships. "In the morning I can't find you anywhere. I look for hours then I realise I don't care. I'm sick and tired of the back of your head. And sometimes I just want to shoot it up with lead. 'til you're dead, so dead." Edwina's voice reminds me of those belonging to fellow musician friends I had in the mid '80s: the angsty girls in black tights, furiously clenching their sweater sleeves into their tiny fists of rage; that 1960s / 80s punky-swampy flavour. She sounds a little like Nico when she speak-sings, but her voice is infinitely more pleasurable to listen to when she sings loudly and confidently. In By Our Own Hand, Harry slips into 1950s crooner style (my god this man's voice is sublime) and with Sick Sick Sick - a standout song on the album - he morphs into a bad juju preacher man. In The Trouble With Girls, the sound actually reminds me a little of punk new-wave (sort of like The Cars but not in an MTV kind of way...). It appears, upon closer investigation - and from noticing a family resemblance in the interior album photos - that Harry is the younger brother of Rowland S Howard, who is ever so slightly a legend in this country's alternative music scene. I imagine this would've been quite daunting for Harry, living in his older brother's shadow and sharing the same passion. However, his style is uniquely his own and deserves to be held in esteem on its own merits. Harry's played bass in Crime and the City Solution and in These Immortal Souls, and guitar with Pink Stainless Tail. Frankly, I'm shocked - considering my age, the subcultures I moved in and my love of music - that I've never heard of Harry before now. If I was trying to be cool, there's no way I would admit that and I'm sure by doing so, I've just committed some sort of alt-hipster crime. But it just goes to show how someone this talented can be absorbed by the larger personalities surrounding him. If you're seeking an album with songs describing happy ever after, look away now. If you appreciate wry, dark humour and the gritty taste of realism then you will love this album. It portrays a tale of urban decay the Australian way, of broken promises and shattered dreams...and yet, is all still a bit tongue in cheek. The mood of the music is simple yet eerie, reminscent of times gone before but powerfully in the present. Harry and the other musicians on the album embrace their influences without pretense and continue to carry the flame for the Australian underground music meme which began over 30 years ago. Favourite tracks | The Old Man Blues, Sick Sick Sick and Since We've Been Dead. Credits | On the album, Harry sings lead vocals and plays the guitar; Edwina sings and plays the organ and stylophone; Dave Graney plays the bass; and Clare Moore plays the drums and sings backing vocals. The album was recorded by Andrew Hehir at Soundpark Studios. The album cover was designed by PM Hutchison.